HostHatch is probably one of the vps providers who provide very affordable prices for their vps services. HostHatch is a registered incorporation based in Tampa, Florida, US and already known as a good vps provider with ssd vps (both OpenVZ and KVM based), 10 gbps vps, and colocation specialties. In this post, I will give a short review about their SSD VPS OpenVZ plan, based on 30 days impressions. All SSD VPS plans provided by HostHatch hosted on their own networks and equipments at Serverius Datacenter- one of the best datacenter in Netherland. Its has good connectivity and reachable all around the globe by utilising BGP4+ networks. Each VPS nodes powered by Intel Ivy Bridge CPUs and RAID 10 SATA3 SSDs to gain best performances. You may take a peek to their own equipments on this page. Other SSD OpenVZ plans also available if you need more power and more resources. At this review, I am using HostHatch OpenVZ SSD VPS v1 – NL – Package 1 – 256MB (ordered on mid November 2013). Its a kinda different from what they offer for current OpenVZ SSD VPS – NL VZ 2 – 256MB plan – especially on bandwidth limit and storage space, since they made some adjustment for their SSD VPS plans at the early of December 2013. What I am using now has more bandwidth (2 TB) but has lesser storage space (10 Gb) and lower CPU clock. 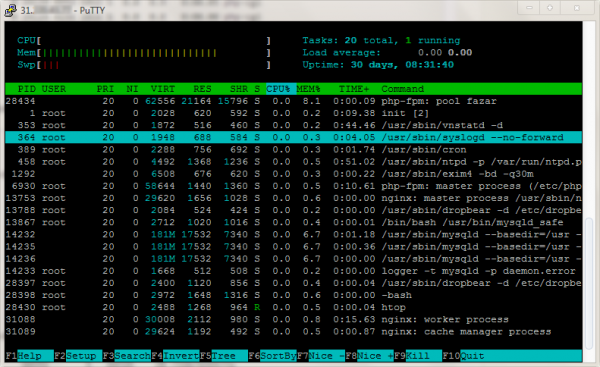 This benchmark has made in my VPS that is running fazar.net with 30 days uptime, which is running on LEMP [Linux (Debian 6 32b-bit), nginx (engine-x), MariaDB, PHP] stacks. 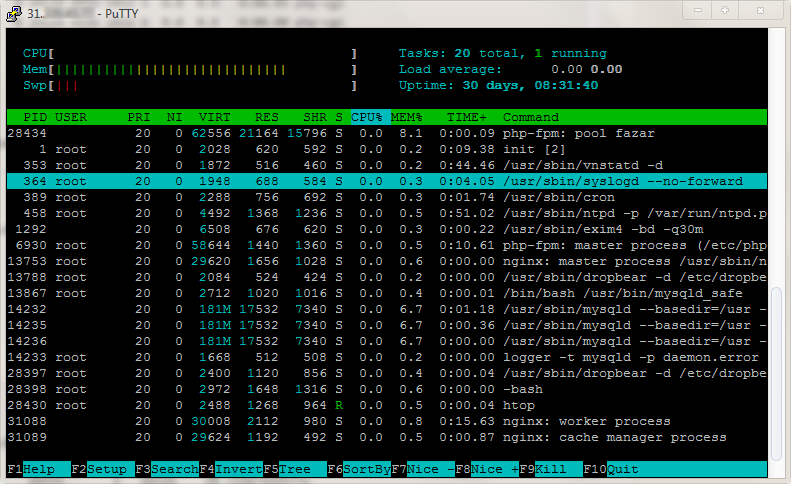 ioping showing good results, since HostHatch’s vps nodes powered by SSD. This one was taken using the famous freevps.us benchmark script. It shows good I/O and nice connections. 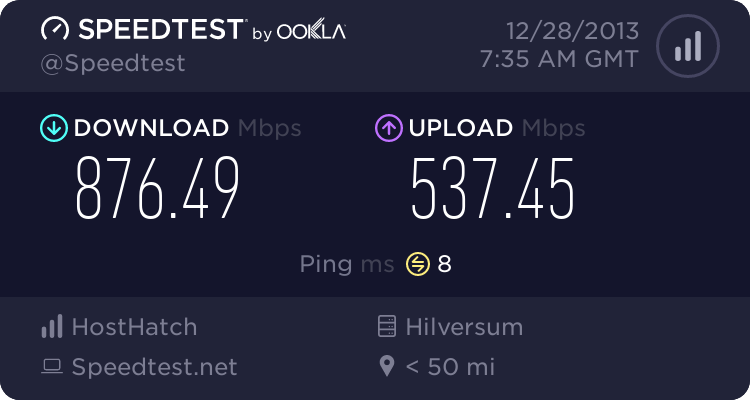 The result as just like they advertised on their website, nearly 1 gbps download and half gbps upload. Once my VPS online, I am also fired up uptime monitoring using Pingdom, and you can see its public uptime results here. Please note that I set Pingdom to do query on port 80 at my VPS IP address, once a minute (its expected able to detects HTTP service downtime even for a single minute). There is some minors downtime happens during December 2013 but it seems caused by network / nodes connectivity issues since no downtime happens on node side. Support is available via online web chat (available if their support/billing staffs is online) and tickets – currently, no phone support available. I have opened some tickets and getting vary response time from HostHatch’s staff – sometimes its answered instantly, and sometimes it take some hours. Their staffs (I got response from some names – Abdullah, Adam, and Kelvin) is friendly and helpful. HostHatch’s VPS plans bundled with affordable prices and good specifications. HostHatch has been featured for a couple times on Lowendbox community. They offering flexible payments and unrestricted cancellation policy. I am happy hosted by Hosthatch – their VPS nodes performances is outstanding, friendly supports, acceptable uptime – all you can get with an affordable price. If you a budget-limited VPS user – or looking for mid-low budget VPS services, I would like recommended you to take a shot on HostHatch VPS plans. FYI, fazar.net has been hosted by HostHatch since 8 months ago using their shared hosting plan, and this blog has been upgraded to use HostHatch’s SSD VPS (OpenVZ) plan since HostHatch has discontinued their shared hosting service. Kl ane pake yg 512 kvm-ssd cukup puas. setup blognya yg ane optimize biar lebih ngacir (webserver nginx, database mariadb, cache APC, wpsc, cdn gratisan pake cloudflare, minify + async). Wah fantez, ane mesti ubek2 blognya kl gitu, cari referensi buat optimasinya. Ane pake nginx+mysql+fpm+APC doang mas, tunning di nginx sama fpmnya doang. running 1 blog aja mas. kadang juga dibikin test running web klien, tapi secepatnya ane migrasi kalo udah punya “rumah” dan domain sendiri. sips… optimasi kernel/tcp tdk Mas? ini membantu banget terutama akselerasi di browser modern semacam chrome/firefox. untuk urusan minify ane pake autoptimize dan caching pake wp-supercache. urusan koneksi asynchronous untuk file js, css, dsb.. dan penyampaian konten statik ane serahkan sepenuhnya ke cloudflare. SCAM from HostHatch! They STEAL MY MONEY after pre-payment for 6 months! I deposited in Advance to my HostHatch account a 6 month pre-payment, incl. the cPanel option, so that when the invoice arrives, my websites and service won’t be interrupted. HostHatch, by mistake, suspended my account because no invoice was generated. I contacted them, they apologised and re-activate my account, BUT now all my websites were not working, my DNS was not resolving as it was before. I asked them politely either fix or refund me because I don’t know how to fix deal with it. They said I should pay another company that they recommend to fix it for me, because for this price they only provide hardware, not support. Since it’s been less than 7 days from my payment/billing cycle, I asked them for a refund. On top of that they never wish to help, like most other hosting providers do. I pay 30$ per month for a VPS including a cPanel (a 6 month pre-payment), I believe at least I should get some support, especially when the problem started after they, by mistake, suspended my account after which all my sites don’t work! So now I prepaid for 6 months then canceled after few days and they keep all my money. Do you guys believe is right to treat your customers this way? Any Recommendation guys you can give me or to them regarding this situation? Abdullah from HostHatch already giving explanation for your case @ Lowendtalk http://goo.gl/rNBQ1A – they are unmanaged hosting provider, you can’t force them to manage your VPS, since their responsibility only to keep your VM up and running smoothly.